The 2013-14 Boston University men’s hockey team must be wondering where all of this scoring was last year. For a team that finished ninth in Hockey East in offense a season ago, scoring has not been a thing the Terriers have been all that accustomed to in recent months. But after this year’s BU team skated off the ice with a 12-1 win against St. Thomas University on Saturday afternoon, it was clear the Terriers offense has changed for the better. In a blowout win against the Canadian school, most things went right for the Terriers during this game. Here’s a closer look of what went right and wrong for BU against the Tommies. Junior Ahti Oksanen has been part of the defensive unit since he stepped on to Commonwealth Avenue in 2012 as a freshman. But before this season, the Finland native had another position listed next to his name for the first time since he was a young kid: forward. And in his first game action of the 2014-15 season, Oksanen was able to play on BU’s top line. To say he made the most of the opportunity is an understatement. The 6-foot-3 forward tallied four goals and earned the game’s No. 1 star. After depositing a second-chance goal a little over three minutes into the game, Oksanen added three more goals between the first and second periods. Playing with freshman forward Jack Eichel and senior winger Evan Rodrigues, Oksanen took advantage of the open ice talent level around him. 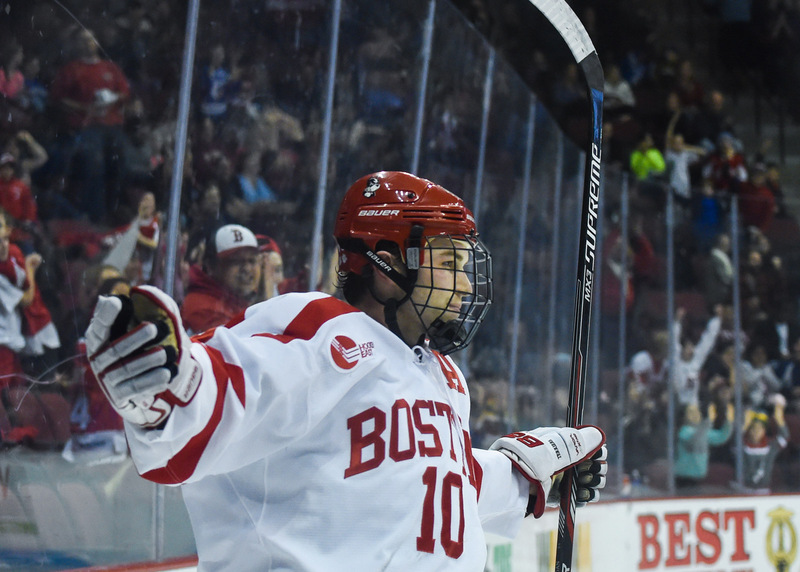 The freshman center gave BU of a taste of just what he can bring to the table. Eichel used his speed and quick hands to weave around the Tommies defensive unit all game long. From his first shift, Eichel appeared composed and in control of the game. He did not score, but Eichel was the primary assist man on five of BU’s goals. On the Terriers’ fourth and fifth goals, the STU defense tried to contain Eichel’s explosiveness by putting multiple defenders on him. But the freshman found a wide open Oksanen both times to extend the Terriers’ lead. Whether it was a toe drag or a quick deke to elude defensemen, Eichel got the job done against STU in the offensive end. Before Saturday’s game, BU coach David Quinn said he hoped his corps of rookie defensemen would get used to the college level quickly. If the weekend’s contest is any indication of the unit’s ability, the group has a bright future ahead of itself. Four of the five starting defenseman against STU had never played a game for the Terriers. The blue-liners’ inexperience mattered little, however. The defensemen excelled in both defensive zone coverage and in their ability to start breakout plays going toward the offensive end. Defenseman Brandon Fortunato stood out among the pack with his plus-6, three-assist game. He also tied for a game-high in blocked shots with three. On BU’s final goal, Fortunato blocked a St. Thomas chance at the point, fed a pass through the neutral zone to freshman forward A.J. Greer, who finished the play with BU’s final goal of the game. Freshmen Brandon Hickey also added two assists and John MacLeod scored a goal. “I thought all of the defensemen did a great job moving the puck, Quinn said. “I thought we came out of our zone clean on numerous occasions, they showed great poise. It’s really nit-picking to say anything went wrong for the Terriers on Saturday, but the one goal prevented BU from a three-goalie shutout. With freshman netminder Connor LaCouvee in goal for the first time, St. Thomas went on the power play and scored with the help of the BU defense. The Tommies took a shot from the blue line that was blocked and flew high and over an unsuspecting LaCouvee. In an attempt to help their goaltender, the BU defense swatted the puck out of the air to try to get it out of harm’s way. Unfortunately, the puck hit LaCouvee and into the net for a goal. In his first goal of his college career, freshman Kevin Duane shot up the right side of the ice and ricocheted a shot off of the goaltender before seeing it bounce into the back of the net. The goal, which served as the Terriers’ only tally of the game, served as more than introductory milestone. For the third straight game, sophomore defenseman Ahti Oksanen set up the play. With the Terriers down 2-0 to No. 17 Rensselaer Polytechnic Institute, Oksanen demonstrated his improved play as he intercepted the puck on the Terriers’ blue line. From there the Kirkkonummi, Finland, native sent a bullet up to Duane, setting the freshman up for a breakaway goal. Becoming a key part of the Terriers’ offensive chances, however, did not start during BU’s bout with RPI. During the team’s 3-1, season-opening win against the University of Massachusetts on Oct. 11, Oksanen registered an assist on all three of the Terriers’ goals. Two of those assists came within 90 seconds of play. Oksanen continued to display his offensive ability the next night when he also helped out freshman center Nick Roberto on his first goal of the season. In fact, a BU freshman has yet to score a goal this season without having Oksanen’s name alongside his on the score sheet. “He’s very [offensively] gifted,” said senior captain Patrick MacGregor. he gets the puck and seems like he makes a great play every time. He looks up the ice, and I think his vision is great. While it was only the third game, Oksanen is on pace to demolish some of his totals from last year. During the 2012-13 season, the defenseman registered had four goals and 13 assists, placing him third on the team in scoring amongst blueliners. This season, however, he is almost a third of the way into last season’s point totals with more than 91 percent of the season left to play. According to Quinn, some of Oksanen’s improvements are a result of his improved defense. “Many a time I envision him getting the puck because he was physical,” Quinn said. The first-year head coach specifically referenced a part of the game where Oksanen laid into another player, and, although they both fell to the ground, Oksanen managed to get to the puck and start a two-on-one. Although senior captain Garrett Noonan and sophomore defenseman Matt Grzelcyk were expected to headline the Terriers’ defense, Oksanen has shown that can also contend with the team’s top defenseman. The 6-foot-3 defenseman has also joined Noonan as part of the team’s top defensive pairing in every game this season. “He is not a dumb guy,” Quinn said. “He is a big guy, and if he can continue to use his size and strength, he is going to be rewarded for it on the score sheet. Last season when Sean Maguire made his first career start as a member of the Boston University men’s hockey team, the then-freshman netminder struggled. After giving up four goals on 14 shots, Maguire made an early exit from the game just 32 minutes into the contest. This season was the polar opposite. Maguire, who won in five of his last six outings last season, carried a shutout into the middle of the third period during the Terriers’ regular season opener Friday night at Agganis Arena. “He was outstanding,” said senior captain Garrett Noonan. “[Maguire] has been great since last year. That’s what he does – he makes big saves. He really kept us in the game especially in the first period. Maguire, who had 39 saves on the night, can thank Noonan for one of those stops. During the first period, Noonan dove across the net to stop the University of Massachusetts from taking an early 1-0 lead. Sophomore defenseman Ahti Oksanen had a hand in each goal tonight. With his three assists, he registered in one game nearly a quarter of the helpers he had during the 2012-13 season. According to BU coach David Quinn, Oksanen’s game improved significantly from last Saturday’s exhibition against St. Francis Xavier. All three of the Terriers’ goals, as well as all three of Oksanen’s assists, came in the span of six-and-a-half minutes in the beginning of the second period. Outside of that stretch in the second period, this game wasn’t necessarily a strong showing from the Terriers. Nonetheless, it did allow the team to start off the season with a win, and gave Quinn his first career win to kick off the season. Both Quinn and Noonan said that UMass surprised the Terriers with its intensity in the first period. Despite the Minutemen spending the majority of the first seven minutes of the period on the penalty kill, UMass had 11 shots on goal in the frame compared to BU’s six. Part of the reason the Terriers looked so sluggish during the first period was the team’s inability to keep the puck in their offensive zone while on the power play. In seven minutes of having a man advantage in the first period, the Terriers had one shot on goal. BU did score its second goal of the game on the power play, but later on in the contest, the Terriers could not take advantage of a 5-on-3 opportunity. While Quinn said the team had good chances during the 5-on-3, the team failed to capitalize. One of the few things that Quinn has repeated multiple times is how he runs the team as a meritocracy. He made that point clear Friday night when sophomore forward Sam Kurker took a spot on the bench for the majority of the second and third periods. According to Quinn, Kurker put himself into that situation after he had two penalties – one for holding and the other for slashing – in the Terriers’ offensive end in the first 22 minutes of play. Despite being one of the Boston University men’s hockey team’s biggest defensemen in the 2012-13 season, Ahti Oksanen was also one of its mildest-mannered, with just 12 penalty minutes over 36 games. However, the 6-foot-3 freshman said when he was growing up in Kirkkonummi, Finland, he looked up to an NHL defenseman known and feared for his mean streak. As BU senior defenseman Sean Escobedo pointed out, Oksanen may not be throwing any open-ice hits worthy of Pronger any time soon. But he has worked over the last year to adapt to the more physical style of North American hockey, trying to blend the offensive gifts he developed on a bigger ice surface in Finland with a stronger approach to playing defense. Oksanen said he was disappointed with his first year at BU, in which he put up four goals and 13 assists. While he improved throughout the year, he acknowledged that his defense needed work early on. In fact, Oksanen was a forward until four years ago, when a coach back in Finland suddenly decided otherwise. He said it took him a while to feel comfortable on the blue line, although he put up 14 goals and 27 assists for 41 points in the 2011-12 season with the Espoo Blues in Finland. For more on Oksanen and his progress throughout the year, including overcoming some language issues, go to dailyfreepress.com. The No. 18/19 Boston University men’s hockey team received a crushing blow to its defense when junior defenseman Garrett Noonan separated his shoulder, forcing him to miss the rest of the season. With sophomore defenseman Alexx Privitera already missing the rest of the campaign due to a team suspension, the Terriers were whittled down to playing their final player on the roster, junior forward/defenseman Matt Ronan. Down to its last resort, BU’s defense excelled Saturday night at Agganis Arena and held Northeastern University scoreless in a 5-0 BU win. The defensive dominance started early for the Terriers, as they held Northeastern without a shot for a little over the first 18 minutes of the game. The Huskies barely controlled the puck in BU’s zone in the frame, as they only attempted eight shots — two of which were blocked. Part of the success was due to the strong defensive-zone play of freshman defenseman Ahti Oksanen. Oksanen, who is recognized as an offensive-minded blueliner and has struggled in his own zone at times this season, had one of his best games of the season in terms of positioning. Oksanen, who is 6-foot-3 and 201 pounds, struggled to handle some of the bigger forwards by BU’s goaltenders earlier in the season when BU lost to Northeastern twice, and even in Friday night’s BU win. However, Oksanen was more successful against Northeastern’s bigger forwards Saturday night. While Oksanen did not produce any offense on the night, three of his fellow defenders did. Senior defenseman Sean Escobedo, who celebrated senior night after the game, led defensemen with two assists in the game. Escobedo, who is usually considered a defensive-minded defenseman, recorded his third multi-assist game of the season Saturday night. He was also a plus-2 on the night and blocked two shots, which leaves him tied for national lead with 91 blocks. While Escobedo is not known for his offense, perhaps the most surprising point of the night came when Ronan earned his first career assist. Ronan rifled a wrist shot toward Huskies goaltender Chris Rawlings that junior forward Sahir Gill tipped into the back of the net. At first glance, it looked as if Ronan scored his first career goal in his fifth career game. With Noonan watching the game from the stands, Ronan will be a part of the team’s lineup the rest of the season. Parker played five defensemen for most of the night, but appeared to give Ronan more ice time as his team’s lead expanded. BU playing well against Northeastern’s offense bodes well for the Terriers entering the Hockey East quarterfinals next week. Merrimack’s offense was only slightly better than Northeastern’s during the regular season, averaging only .06 more goals per game. ORONO, Maine — Early this season, it was almost impossible to talk about a strong Boston University men’s hockey performance without mentioning multiple freshmen. That was true again on Saturday, as rookie goalie Sean Maguire held his team in the game long enough for his classmates – Danny O’Regan and Matt Grzelcyk chief among them – to secure the 5-4 BU win at the University of Maine. Through two periods, Maine (8-16-6, 4-11-6) had 24 shots and just one goal. That goal was the one Maguire said he’d like to have back, a second-chance shot for Maine’s Ryan Lomberg after the initial attempt was blocked. By the end of the night, Maguire had allowed four pucks past him but stopped 40 more, a season high for BU (14-2-2, 11-7-2 Hockey East) goalies. While Maguire was turning away shot after shot, O’Regan scored twice on the power play, his 11th and 12th goals of the year. He got the Terriers on the board with a power-play goal in the second, and his next tally, which gave BU a 4-1 lead, was set up by his classmate Ahti Oksanen. Oksanen controlled a rebound on a third-period power play and found O’Regan wide open at the side of the net. Oksanen also took the initial shot that led to O’Regan’s first goal, picking up two assists the night after scoring the game-tying goal and an assist on Friday. After not recording a point since Jan. 19, he had four this weekend. Despite cooling down offensively somewhat this semester, Grzelcyk still ranks second in Hockey East in points by defensemen (and ties for third in freshman scoring, behind O’Regan and Northeastern’s Kevin Roy). He got back on the scoresheet in a big way Saturday, driving into Maine’s zone alone and snapping a wrist shot over Ouellette to make it 3-1 with less than a minute remaining in the second period. Grzelcyk also blocked two shots and played a more physical game than usual in the defensive zone. Of course, the nine players who recorded at least one point for BU Saturday make clear that the freshmen didn’t win the game alone. But the Terriers’ first-semester success was largely defined by its rookies: strong performances from both Maguire and classmate Matt O’Connor, consistent offensive production from O’Regan, scoring threats from Grzelcyk and Oksanen on the blue line. Since New Year’s, those contributions have been less consistent. Saturday’s win was far from perfect, but it was one small return to early-season form for a team that’s a long way from where it was in December. BU’s two sophomores were crucial to Saturday’s win as well. Second-year center Cason Hohmann had a goal and an assist, and right wing Evan Rodrigues, after being denied by Ouellette on multiple Grade-A chances throughout the night, finally set up the winning goal with 3.8 seconds left in overtime. “In general, it wasn’t just the freshmen, but … a pretty good effort from everybody,” Parker said.